Acclaimed author, editor, and translator Daniel Hahn is back again with an insider’s perspective on all things related to translation. This week, he responds to a question from Belgian reader Karel Caals and reveals the inner workings of judging translation contests, grants, and prizes. 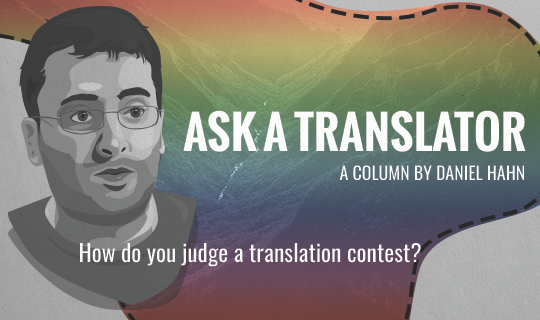 Have you ever judged a translation for a contest or a grant? If so, what was the process like; what do you look for, especially, to separate the wheat from the chaff? One day I’m going to write one of these columns that won’t just say, essentially, “it depends”. But since you ask: It depends. Yes, I’ve been on judging panels for translated fiction (such as the Independent Foreign Fiction Prize for adult fiction, the Marsh Award for children’s); or for fiction in English for which translations are eligible alongside originally Anglophone work (the IMPAC Dublin Award for adults, the UKLA Book Awards for children); as well as grant-making committees for organisations like English PEN, which for some years has supported the translation of international literature and the promotion of translated work in the UK. And, yes, each is looking for something subtly or drastically different, and each has quite distinct criteria, and so it depends. In most cases, the aim is to find a really good translation (I’ll pretend for a moment that we’d all agree what that is), though not infrequently the translations are judged in such a way that the act of translation per se, and the translator her/himself, aren’t mentioned in the evaluation process at all. I’d much rather they stuck J.K. Rowling’s name on my book than insisting on mine. We might even sell a few copies. Our resident translation expert Daniel Hahn is back with a response to the hotly debated issue of how and where to credit translators’ work. This question comes from Michelle Loh in Singapore. Why aren’t translators’ names on most book covers? Are you for or against this practice of keeping translators’ names hidden? Their argument, then, is that translations are hard enough to sell as it is without your having to remind people that the book is a translation before they’ve even picked it up. There are plenty of publishers I like very much who make this argument, and I do understand. I do think it underestimates our readers, but where most publishers are concerned I really don’t see this as a lack of respect for the translator’s work. In normal circumstances, then, it’s not my job to make the book better. 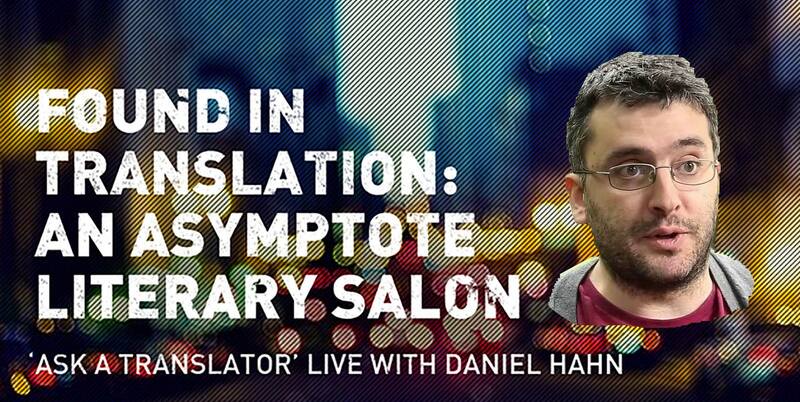 We’re bringing you the latest meditations on translation from acclaimed author, editor and translator Daniel Hahn. 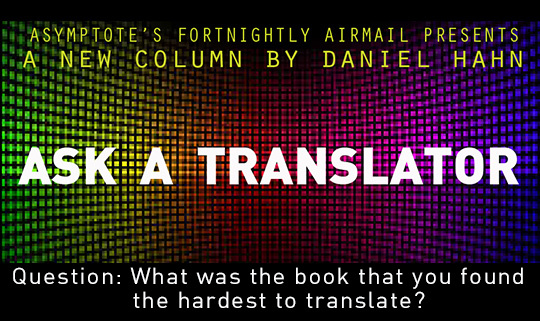 In “Ask a Translator,” he answers burning questions from readers about the gritty details of his chosen career. Today Daniel responds to Asymptote reader Tony Liang from Beijing, China. Do you think the translator should be allowed to edit the text he translates? It is not my job to change a text I’m translating. Indeed, my aim at its most essential is exactly the opposite: to focus all the ingenuity I have on figuring out specifically how to change nothing, how to give my publisher precisely the book we started with—not abridged or corrected or improved, but my best attempt at keeping it just the same, the language changed but nothing else. To rewrite the text in entirely new words while seeking to have as little of my own collateral effect on it as I possibly can. Leaving aside the fact that that’s impossible (because even as it keeps things the same, the process of translation is also changing everything), that’s the intention, that’s what we like to pretend is happening. Maintaining structural, narrative, tonal integrity, if you like, and faking it with all the rest. In normal circumstances, then, it’s not my job to make the book better. It’s not my job to make the book more palatable to a reader. It’s not my job to fact-check a book and correct its mistakes and inconsistencies. My job is to write the same book. That’s the general idea. Translation, like any kind of writing, depends on instinct, you mustn’t forget that. But remember, too, that even instinct can be trained. We’ve been hungry for more since Daniel Hahn made an appearance at the Asymptote Literary Salon in London two weeks ago. This week, we’re back with translation advice from the author, translator, and editor answering the following question from Singapore-based Asymptote reader Michelle Loh. What can a translator do to improve? "...my aim is to take one superb piece of writing, and make another superb piece of writing that can stand in for it with a new set of readers." 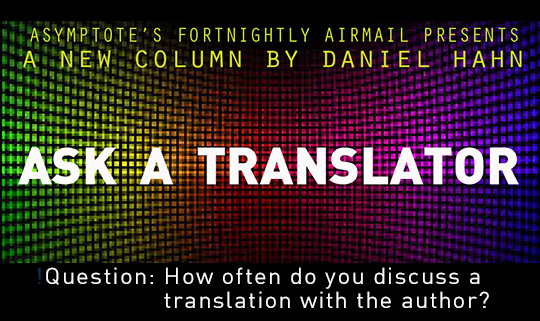 Since we launched our ‘Ask A Translator’ column last December, award-winning writer, editor and translator Daniel Hahn has been on hand to remedy the translation woes of Asymptote readers around the globe. Given the overwhelming love that our readers show for the column and Daniel (seriously, you guys are the best), we can’t wait to welcome Asymptote fans to our very first literary salon today at Waterstones Piccadilly, London on July 20th. The event will be hosted by our Editor-at-Large, Megan Bradshaw and will see Daniel fielding questions from the audience and our readers via Twitter. You can find out more about the event and reserve your place here, or if you can’t attend the event, tweet us your translation question with #AskATranslator. “Imagine approaching pretty much any writer and saying, “Look, here’s the plan, we’re going to change lots of things in your book—no, I really mean lots of things, like all the words—then we’re going to publish it all over the world in your name, but you won’t get to see what it actually says… Sound OK?” They’d be within their rights to feel more than a little uneasy about it. Translation is really something other than a striving for vague perfection. Our resident translation expert, writer, and jack-of-all-trades, Daniel Hahn, is back to respond to reader questions on the fine art of translation. Today’s question comes from Lin Chia Wei, a reader in Taiwan. And—don’t miss our first-ever “Ask a Translator” live event with Daniel Hahn in London on Wednesday, July 20 (RSVP at or invite your friends to the Facebook event page here). Is there anything that is completely untranslatable, in your opinion? Everything is untranslatable, that’s what I think. Or alternatively, I think that nothing is. And honestly, I’m perfectly comfortable with either of those ideas; both make sense to me. I’m not altogether comfortable, however, with the idea behind the question itself. There are certain components to a text that are likely to present particular challenges to a translator (I talked about these in last month’s column), things that feel like absolute impossibilities. And conversely there are moments when you’re translating and a clever solution presents itself, or when a new voice you’re creating comes into focus, and the sheer rightness seems miraculous, the fact of it being so very possible feels exhilarating. But these experiences, and the question, would seem to suggest a simple binary—translatable / not translatable—which is misleading. Translation is all failure, because it’s never “perfect”; and it is all also, simultaneously, a triumph, because however imperfectly something living has been created out of the most unlikely circumstances. Sorry, “certain idiosyncratic syntactical structures” is a horrible phrase. In English, at least. 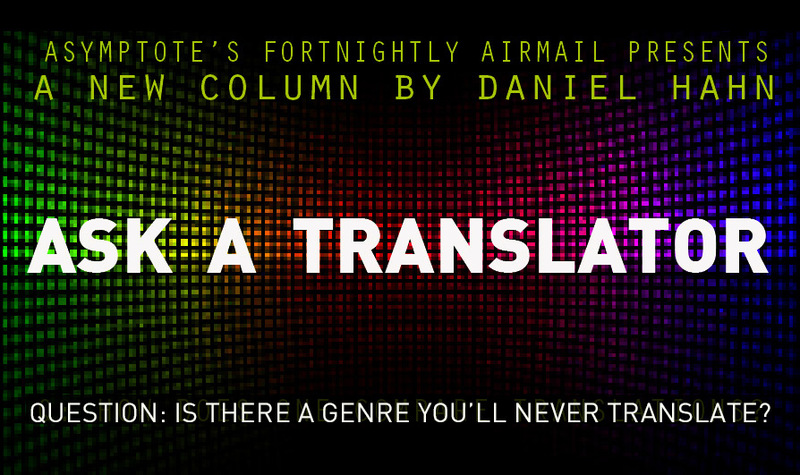 Our resident translation expert, writer, and jack-of-all-trades, Daniel Hahn, is back to respond to reader questions on the fine art of translation. Today’s question comes from, once again, Romanian reader, physicist, poet, and translator Marius Surleac. Throughout your career, what was the book that you found the hardest to translate? I have two very different answers to this, depending on your interpretation of the question. I’ll give you one of them. The first thing to say is that there are, of course, lots of interesting ways a book can be difficult, lots of writerly qualities to tax a translator’s re-creational skills. ...Get a contract. Make sure it’s unambiguous. Make sure it’s comprehensive. Make sure you understand it. Have you experienced troubles with any publisher and if so, what’s your advice for a novice? Have I ever experienced any troubles with a publisher? Yes! Because honestly, I’ve published close to fifty books so far, with publishers of all kinds, in various countries, so it would be surprising if every experience had been equally, perfectly smooth. Yes, of course there’s trouble, sometimes. And that trouble, naturally, can take several forms. "As a translator, I feel some responsibility to the writers I translate." • Militant groups kill dozens in Brussels bombings! • Britain’s campaign to split from the E.U. heats up! • Trump and G.O.P. rivals escalate anti-immigrant rhetoric! These are stories of division. They are stories of a failure of empathy, a failure of imagination. Stories of willful misunderstanding. Stories that tell us how the powerful capitalise on failed media and failed education systems to persuade the powerless that the only thing that really matters is how people are different, not how they are the same. Either I’m being a parasite on their work, or they’re being a parasite on mine—but either way, it’s potentially a delicate, complex relationship. 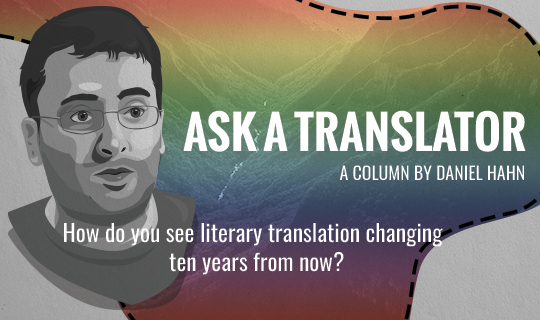 How often do you discuss a translation with the author? You can see why the whole business could make an author nervous. Imagine approaching pretty much any writer and saying, “Look, here’s the plan, we’re going to change lots of things in your book—no, I really mean lots of things, like all the words—then we’re going to publish it all over the world in your name, but you won’t get to see what it actually says… Sound OK?” They’d be within their rights to feel more than a little uneasy about it. A book over which they have absolutely no control, going out as though it were theirs, allowing all the world’s readers and critics to judge them, based on… what? Sure, we may not really phrase the question quite like this, for obvious reasons (mostly because I’m guessing nobody would ever say yes), but this is essentially what a writer is signing up for every time she or he agrees to have a book published in translation. Translators have been known to grumble about their authors wanting to meddle in their translations, but I’m not one of those translators (OK, except that one time—you know who you are…), because I do understand the anxiety. Frankly, I’m rather surprised anyone lets translation happen at all. I’ve done book-length literary translations of more than twenty different writers, and I have always sought to involve the writer in my process. (Well, the only exception was dead and, I assumed, probably past caring.) And they almost always express an eagerness to help. (Same single exception.) For various reasons, writers being translated into English tend to be far more involved in the process than writers being translated out of it, which suits me. "If at all possible, only translate the kind of books that you feel able to understand." Is there any genre that you would never translate? The short answer is no—I’d translate anything. Having said that, however, the short answer is in fact a lie. I wish it were true, but it isn’t. Why? Well, it all comes down to reading and writing. That’s all translation is, after all. I think of myself as a pretty open-minded reader; a reader, in other words, with wide sympathies. Yes, I have particular inclinations towards certain kinds of book, of course—who doesn’t?—but I’m able to tune into all sorts without too much trouble. Which for a translator is important! You need to be able to find your way to a sympathetic connection with a book if you are to translate it (well, it helps), so frankly it pays to be flexible in your sympathies. And I think of myself as a pretty versatile writer; which means I should have the tools to create anew (but now in English) many different kinds of books. This means being able to rely on a suppleness of language and register, a good ear for all sorts of dialogue—stuff like that. Which, for a translator, is also important. You need to know what’s involved in writing a book, you need complete mastery of its operating techniques, of its rhythms and dictions and tricks, if you’re to recreate it. It is much less common for me to be asked to translate, say, the more commercial end of crime writing (or, for that matter, any non-fiction at all); and I’ve never once been offered any sci-fi, or romance fiction, and not a single graphic novel; I’ve never had the option of taking on a literary classic or a cookbook or a horror novel; or many other categories besides. And what would I say if were in fact asked? I’d always accept, of course! When a publisher commissions me to translate a novel I do work under the pretence that I’m writing not a translation but the translation. 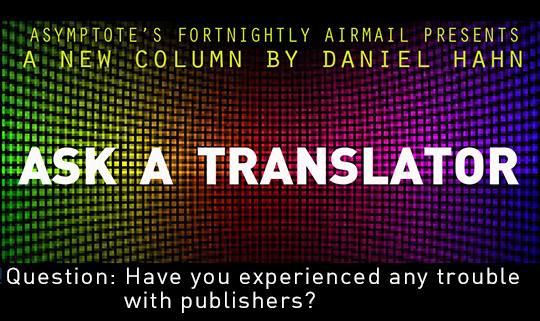 “Ask a Translator,” a new feature in which acclaimed writer, editor and translator Daniel Hahn answers reader questions about the ins and outs of literary translation, debuted in Asymptote‘s fortnightly airmail ten days ago (subscribe here). Since not all blog readers may have subscribed to the airmail, we decided to reprint this hugely popular column today! When comparing two translations of the same text, what does one look out for to determine which is the superior translation? Or does it all come down to different style? Translation is never a neutral act. It cannot happen without interpretation or personality, and it can’t happen without context. Which also means one of the reasons it’s hard to compare translations, even of the same text, is that no two translators will be aspiring to quite the same thing. Certainly the premise behind the question is entirely correct—any two translations of anything will differ, and those differences will have some significance. But those differences won’t always allow you to evaluate the versions side by side on the same metric scale. Now, when a publisher commissions me to translate a novel, I do work under the pretence that I’m writing not a translation but the translation. That’s the pretence, and aspiration—as though what I’m writing is not personal and defined by its million individual choices, and not contingent. And yet I know, of course, that it must be, because another translator will notice things in the original that I don’t, or I’ll choose to privilege things that she won’t; because my palette for expression in English will be different from hers, because we all as writers of English have languages that are distinct, words or constructions we particularly like or don’t. The fact that my English is (mostly) British and (mostly) 21st century will play obviously into what I produce. And what about that publisher—am I producing a translation for a big commercial publisher, or for an academic publisher, or for a “classics” list? Those things, and the assumed readerships they imply, will inform my intentions, too. (If you’re translating a play, is it for the sort of publication where you want every cultural detail preserved and explained or is it for performance where actors have to be able to speak the lines and you have to remember to punctuate in such a way that they can occasionally breathe?) As I say, the process is never neutral. Your question pertains, mostly, to pretty long-lived texts (it’s unusual for a modern work to be translated multiply), which means that translations can themselves differ in period. Even within Tolstoy’s lifetime there were several competing English Wars and Peaces, each one working to a different agenda from Rosemary Edmonds in the 1950s, Anthony Briggs in the early 21st century, or the many in between. Each translators will have understood her/his role differently. (Should they seek to be invisible, hiding the fact that the book’s translated, making it sound naturally English, or draw attention to its foreignness? As much as anything, this is a matter of politics and fashion.) They will have made different assumptions about what their readers want, and how much their readers know. Are they working for scholarship, or to make a great story as accessible as possible to newcomers? These questions reveal nothing about which translation is “superior”, but rather indicate their differences in intent. A translation of a comic novel might produce more or less straight, stone-dead translations of the jokes with footnotes to explain the cultural references that underpin them; or it might reconstruct the jokes, changed to make Anglophones laugh, thereby losing some of the cultural specificity but obviating the need for reader-distracting footnotes. Is one of these decisions “superior”? Well, it depends what you like, what you want. Go see Romeo and Juliet three times. One production might speak the verse beautifully, making you notice details you’d not noticed before. Another might be brilliantly paced, a really dramatic theatrical experience. A third might be a film, or Prokofiev, or West Side Story. They’re all the same, and not the same. Translations always are. Some years ago when I finally decided to read Don Quixote in English, I chose Edith Grossman’s translation. I knew I wanted something more or less recent. I knew hers would be careful and sensitive, but also energetic, and I knew she also had the skill to make me laugh in the funny bits. I could have argued, of course, that the closest experience to reading Cervantes would have been Thomas Shelton’s translation, which is four hundred years old and would have been read by Cervantes’s own contemporaries (Shakespeare among them, of course). But I wanted something that bridged the gap between Cervantes and me in a certain way. Grossman’s translation was the perfect particular translation for me, but in part what that means is it did exactly what I wanted a translation of Quixote to do for me at that moment. It captured Cervantes’s book, but did it in a way that suited my sensibility, and what I like as a reader. Does this mean there’s never any difference in quality between one translation and another, and it’s all a matter of taste, with everything indiscriminately valid? Of course not. Some translations are sophisticated and sensitive and effective; some display a profound failure to understand an original and a total inability to write pleasing, supple prose to replicate it. Some things are just mistakes. But difference is often just difference, too. So instead of assuming that one of two translations is necessarily superior and the other more flawed, consider what the differences tell us about what precisely the translator is actually trying to do and why. (I love books with a Translator’s Note.) Only then can you try to gauge whether it’s a success, but according to its own criteria, not somebody else’s. Enjoyed this column? Subscribe to the next one here.